After five weeks in the spaces of Fondazione Pistoletto, the Dutch students from Arnhem’s Academy will present their artistic research and the relative development process in the course of a public event scheduled for tomorrow – Tuesday 12th February – at 5 pm. 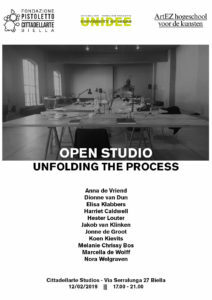 Twelve protagonists for as many individual researches: after five weeks at Cittadellarte, the Dutch students from ArtEZ Academy will present their practices – developed also through Cittadellarte’s natural contaminations – to the public, in the course of the open studio ‘Unfolding the Process’. As suggested by the title of the event, the residents will in fact illustrate the artistic process which led to the realization of their works. It is the final chapter of ‘Cittadellarte & ArtEZ Residency Programme’, started five weeks ago. As mentioned in one of our previous articles, the initiative, curated by the UNIDEE office (in the persons of Juan Sandoval, Annalisa Zegna, Clara Tosetti) and Michele Cerruti But (coordinator of the project and of Cittadellarte’s High Education programmes), saw the participation of Anna de Vriend, Dionne van Dun, Elisa Klabbers, Harriet Caldwell, Jakob van Klinken, Jonne de Groot, Koen Kievits, Melanie Chrissy Bos, Marcella de Wolff and Nora Welgraven, at the 4th year of BEAR, the most innovative bachelor’s degree in Visual Arts in the Netherlands. The project has represented for them a great opportunity for personal growth (they all are at their first residential experience and ten of them are in their last year of a bachelor’s degree in Visual Arts) and an important formative instrument. Save the date, then, for tomorrow’s public open studio at Cittadellarte, via Serralunga 27, Biella, from 5 to 9 pm.